I believe this is the grave of little Willie Adams who died October 23, 1877, age 4 months, 22 days, in Sacramento, California. This little stone touched me so when we visited the cemetery on Saturday – and I had no idea when I looked it up today that the dear child died on this day (which is also my birthday). It sends a shudder down my spine but at the same time fills my heart that this dear baby was so loved, and after 135 years not forgotten. He was just at that age when babies start to laugh and really see the world around them. 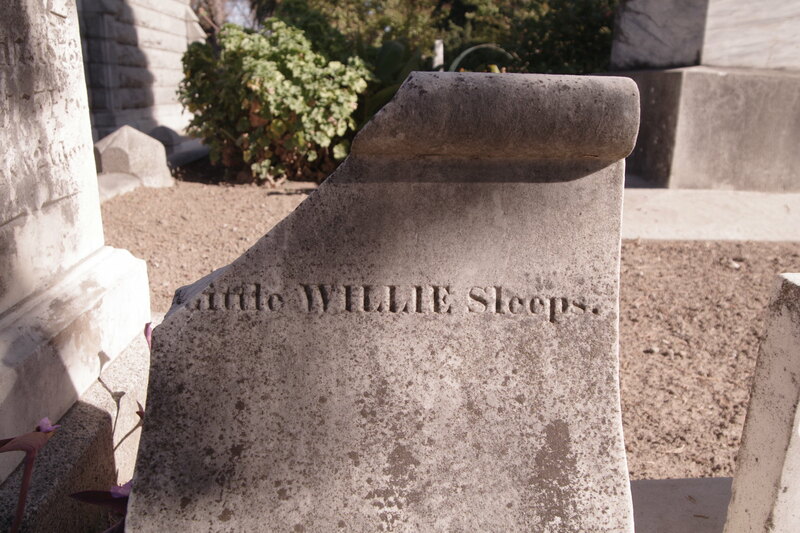 This entry was posted in Ghosts, Gothic, History, Parenting, Vampire Maman, Vampires, Victorian and tagged 1877, grave stone, gravestones, Little Willie Sleeps, love, love never dies, parenting, sacramento, sweel slumbers, Willie Adams. Bookmark the permalink. I was sort of numb when I saw the date – like a cold kiss from a little bitty ghost.